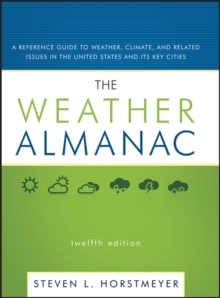 The Weather Almanac, 12th Edition is a resource for a variety of climate and meteorological data including both domestic and international weather trends, historical weather patterns dating back 1000 years, natural disasters, and a 20 page glossary of weather terminology. The book is complete with detailed maps, pictures, and tables compiling climate data from a variety of sources, including the National Weather Service and the US Geological Survey. Separate sections in The Weather Almanac are devoted to tornadoes, hurricanes, thunderstorms, and lightening, flash floods, and winter storms, and they have been edited from official reports by governmental agencies. The new edition has been updated to include recent disasters such as the 2004 Indian Ocean Tsunami that devastated Indonesia as well as 2005 s Hurricane Katrina. These chapters serve as a basic reference for severe weather and extreme conditions, which can assist in preparing for a weather emergency.